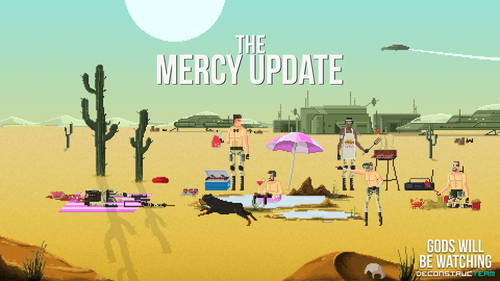 Deconstructeam and Devolver Digital have released the “Mercy Update” for the indie thriller Gods Will Be Watching on Steam, Humble and GOG, bringing sweet relief to those gamers that found the harder paths through the game a bit too hard. The update to the critically lauded title brings new challenge settings that adjust the game’s overall difficulty and a new option to remove the element of chance from decisions made throughout the game. It’s still no cakewalk though, chumps. New challenge settings range from Original Mode, which keeps the game’s full difficulty intact, to a new Puzzle Mode that removes all elements of chance and Narrative Mode for gamers looking to just experience the story with minimal obstacles to success. Puzzle Mode All the challenge of Original Mode, but without random factors in play. If you want to remove the element of chance from the game, this is the mode for you. Puzzle Mode Light The easier version of the game that also removes random factors and chance. If you want to remove the element of chance and face easier puzzles, this is the mode for you. Narrative Mode The easiest mode and a way to enjoy the game as a narrative experience, without a heavy challenge. Gods Will Be Watching is available now for PC, Mac, and Linux via Steam, GOG, and Humble. For more information on Gods Will Be Watching or to try the original prototype, visit godswillbewatching.com. Independent developer Deconstructeam and pottery enthusiasts Devolver Digital have released The Red Strings Club on Steam, GOG, and Humble with a 15% off launch discount through January 30. Developer Reikon Games and the publishing androids of Devolver Digital have launched the brutal cyberpunk action shooter RUINER on Xbox One, PlayStation 4, and PC. Picking up the Strafe demo last fall, the Quake-inspired, roguelike FPS immediately did exactly what I hoped it would, ie. delivering an instantly gratifying, kinetic killing spree with a fastness and fury to make Vin Diesel look like a slow and entirely placid sloth. Low-polygon horrors swarmed at me, demanding torrents of hot lead. Bullets rattled and fuzzy explosions painted the tight, labyrinthine corridors red, as said beasties were churned and shredded by my mighty death-engine of flowing circle-strafes and hurtling, overhead bounds. It was a gloriously giddy – and tightly-honed – festival of crowd-control slaughter, and it made me very happy indeed. If Strafe’s roguelike, rinse-and-repeat structure was going to deliver an infinite Quake generator of that deliciously brutal calibre, then I was all-in.